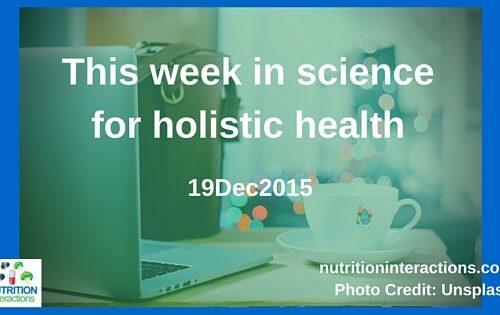 Welcome to the second edition of This Week in Science for Holistic Health update! 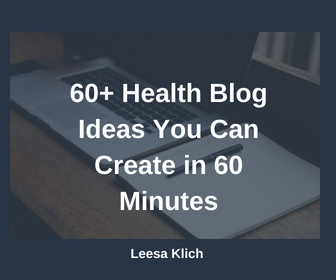 I scour the science sites for new, interesting and relevant information that applies to a holistic approach to health. But before we dive into the post – Wishing you a healthy and happy Christmas! I also include new science-based books that look interesting (’cause I LOVE reading!). Nope – Vitamin C has NOT been shown to cure or even treat colon cancer. This study was done in cultured human cells with two of the common colorectal cancer mutations, so it doesn’t even cover all of the known cancer mutations. For more information on science-based complementary and integrative approaches to cancer, see this link. Yun et al. studied human colorectal cancer cells with KRAS or BRAF mutations and found that they “handle” vitamin C in a different way than other cells, ultimately to their detriment (see the Perspective by Reczek and Chandel). Because the abundance of a certain receptor is increased in the mutant cells, they take up the oxidized form of vitamin C (dehydroascorbate). This leads to oxidative stress, inactivation of a glycolytic enzyme required by the mutant cells for growth, and finally cell death. Whether the selective toxicity of vitamin C to these mutant cells can be exploited therapeutically remains unclear. Intake of meat and vegetable servings were significantly higher in the memory period compared with the cell phone period, regardless of the order. Results from the focus group indicated a positive attitude toward the use of cell phone pictures in recording food intake and an increased awareness of food choice and portion size…. Cell phone pictures may be an easy, relevant, and accessible method of diet self-monitoring when aiming at dietary changes. Future trials should combine this technique with healthy eating education. Dietary recommendations and treatment of patients with recurrent idiopathic calcium stone disease. Looks like a holistic approach to calcium-containing kidney stones is being recommended in this article! Look at urinary, metabolic, nutritional, environmental and lifestyle risk factors, and then motivate the patient to adhere to their specifically-tailored advice. AND, preventing stones actually saves suffering and money. Win-win! It is also of immense relief and benefit to the patients not to have to suffer the discomfort and inconvenience of further stone episodes. This meta-analysis (i.e. one of the highest levels of scientific studies because it analyzes/reviews multiple previous studies on the topic)(1) showed that sedentary behaviour was associated with (not causal, ‘associated with’) an increased risk of colorectal cancer in women but not men. A recent meta-analysis found that sedentary behaviors are associated with an increased colorectal cancer (CRC) risk. Yet, the finding on TV viewing time, the most widely used surrogate of sedentary behaviors, was based on only two studies. Furthermore, light-intensity activities (e.g., standing and slow walking), non-sedentary by posture but close to sedentary behaviors by Metabolic Equivalent Task values, have not been investigated in relation to CRC risk. … In women, those highly sedentary and physically less active had an approximately 41% elevated risk of CRC (95% CI=1.03 to 1.92) compared with those less sedentary and physically more active. The other sedentary behaviors and light-intensity activities were not related to CRC risk in women or men. In conclusion, we found that prolonged sitting time watching TV was associated with an increased CRC risk in women but not in men. Yoga participation and all-cause mortality: National prospective cohort study. This study looked at over 22,000 people who participated in the 1999–2006 National Health & Nutrition Examination Survey, of which 240 reported doing yoga. Looks like, after adjusting for age, that yoga was not shown to reduce all-cause mortality (i.e. death from any cause). In conclusion, yoga participation was not significantly associated with reduced all-cause mortality risk in an adjusted model. Gut microbiota in health and disease: an overview focused on metabolic inflammation. Science is just starting to figure out the vast role that gut microbiota have on human health. Past decade has witnessed an enormous amount of research investigation and advancement in the field of obesity, diabetes and metabolic syndrome, with the gut microbiota receiving a special focus in the triangle of nutrition, health and diseases. In particular, the role of gut microbiota in health and diseases has been one of the most vigorous and intriguing field of recent research; however, much still remains to be elucidated about its precise role in host metabolism and immune functions and its implication in the onset, progression as well as in the amelioration of metabolic ailments. BCP = Bioactive Collagen Peptides, the brand VERISOL was used for this study. In this double-blind, placebo-controlled clinical study, we investigated the efficacy of specific bioactive collagen peptides (BCP) on the cellulite treatment of normal and overweight women….The results of the study demonstrated that a regular ingestion of BCP over a period of 6 months led to a clear improvement of the skin appearance in women suffering from moderate cellulite. Based on the current data, it can be concluded that a long-term therapy with orally administered BCP leads to an improvement of cellulite and has a positive impact on skin health. In the present study, it could be demonstrated that a daily dosage of 2.5 g BCP has a positive impact on women affected by moderate cellulite. Beside a significant improvement in the cellulite score, results also revealed a significant decrease in the waviness of the thigh skin as well as dermis density strengthening after BCP treatment. Two VERISOL products are approved for use in Canada, the medicinal ingredient is “hydrolyzed collagen” – Verisol P, and Verisol B. Helps increase skin elasticity. Helps augment skin elasticity. Helps promote healthy collagen production. Helps promote healthy elastin production. Helps reduce wrinkles and fine lines. Helps reduce eye wrinkles. Helps reduce eye wrinkles within 4 weeks. Helps reduce fine facial lines. Helps increase skin elasticity and reduce wrinkles. Helps increase skin density. Helps with the appearance of smooth skin. Helps to enhance skin surface profile. Looks like there is enough bio-available vitamin B12 in chlorella to be successfully used by vegans and/or vegetarians. Since vitamin B12 occurs in substantial amounts only in foods derived from animals, vegetarians and particularly vegans are at risk of developing deficiencies of this essential vitamin. The chlorella used for this study is a commercially available whole-food supplement, which is believed to contain the physiologically active form of the vitamin. … The results of this work suggest that the vitamin B12 in chlorella is bioavailable and such dietary supplementation is a natural way for vegetarians and vegans to get the vitamin B12 they need. Pregnant women may be better off taking more than just an iron and folic acid supplement. to look for any heavy metal contamination. The use of complementary and alternative medicine is becoming increasingly popular worldwide1,2. It is generally believed that since herbal remedies are of natural origin, they are therefore safe, that there are legal safeguards in place to ensure quality, and that they have fewer side effects than conventional medicines3,4. Recently, questions surrounding the safety and legality of complementary and alternative medicines (CAMs), such as traditional Chinese medicine (TCM), have prompted increased scrutiny. Several studies have shown that there is a lack of accuracy in labelling of some TCM, with undeclared animals and plants, including toxic and endangered species identified by DNA analyses5,6,7. It has also been shown that some TCM contain unsafe levels of heavy metals8, or can be adulterated with pharmaceutical drugs9,10,11. However, the negative health impacts of herbal medicines are difficult to quantify, as reporting rates for adverse reactions are low and the use of herbal medicines is often not reported to healthcare professionals9. Here is a very interesting image showing that 24 of the 26 Australian TCM samples tested positive for at least one of the three concerns. Of the 26 TCMs investigated, all but two can be classified as non-compliant on the grounds of DNA, toxicology and heavy metals, or a combination thereof (Fig. 1). In total, 92% were deemed non-compliant with some medicines posing a serious health risk. I recently wrote a blog post about the Canadian supplement regulations and requirements where I provide links to Health Canada’s recalls and safety alerts (when an adulterated or otherwise unsafe product is found and is announced to the public), as well as how to report side effects of supplements.